1. I can hang with a pattern that has single cables crossing at every stitch. (There was some doubt about that when I started). 2. I do not have second sleeve syndrome..I love sleeves! 3. I LOVE textured knits. I was not ever bored..at all. 4. My favorite new skill..short row capped sleeves!!! It’s a bit time consuming (think like turning a heel, but shoulder sized). 1. Quince and Co yarn is lovely..and it grows a lot after blocking. The sleeves alone are about 3 inches longer than what I knit. I knew that and planned for it, and the fit is perfect. 2. 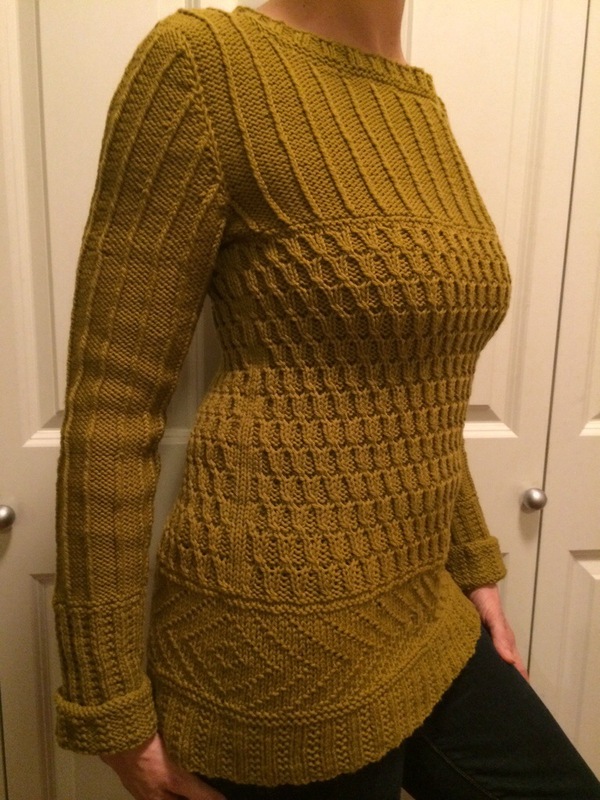 I did not do the waist shaping because the single cables have a stretchy rib effect. Clearly it doesn’t need it! 3. My dog was a tad jealous and wouldn’t let me photograph it! I can forgive him because I hadn’t washed it yet and he’s so dang cute! 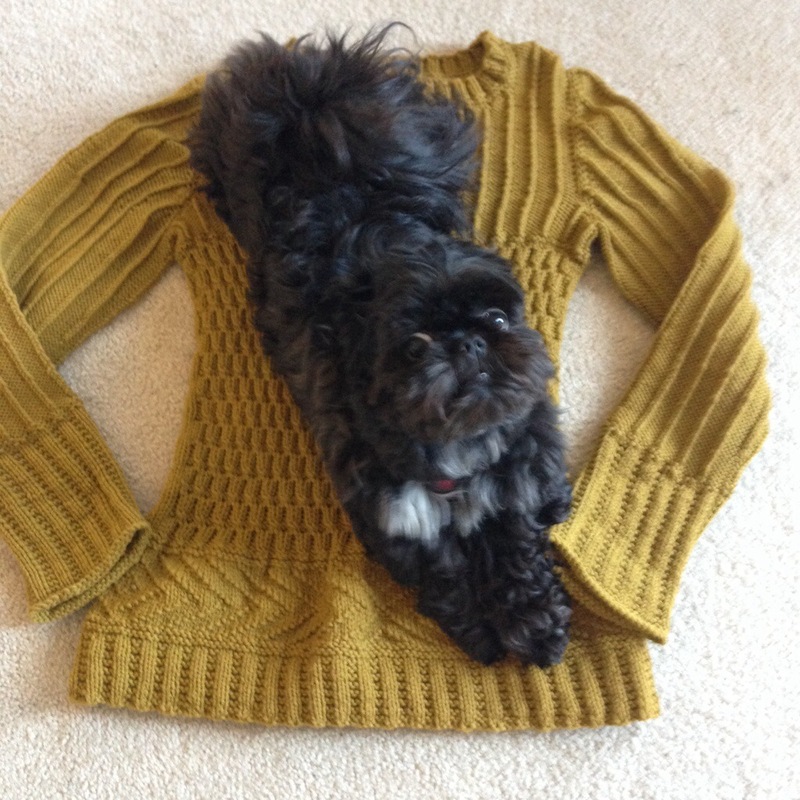 This entry was posted in Inspiration, knitting and tagged handknit, handknit sweater, knitting by Leah. Bookmark the permalink. Thanks Raquel! I’m not gonna lie..I’m totally stoked to wear it to work today! Hahahaha! I am right there with you! He’s been jealous of this sweater..I was getting more lap time than he did! Thanks for the comment on the sweater too! Wowww…. I love the texture! Me too! That’s my favorite part of the design..fitted with texture? What more could you want? Thanks! Fantastic job! I have a shih tziu too! Mine is beige. Great dogs. Your sweater is so beautiful. Thanks Valerie! Yeah, the doggy trumps every picture he’s in for sure!! Shitzu’s have the best personalities!! Thanks for the comments on the sweater too. I’ve been wearing it at work all day and it’s sooo comfortable!